Photo by Nick Woodward-Shaw MESA, Arizona -- Sept. 21, 2018 -- Mesa Community College’s Fall 2018 Arts season brings performances and exhibitions that feature up-and-coming student artists and renowned craft masters presented in exquisite venues on MCC’s Southern and Dobson campus (1833 W. Southern Ave.). The Performing Arts Center (PAC) delivers exceptional acoustics and visibility for musical, instrumental and dance performances. 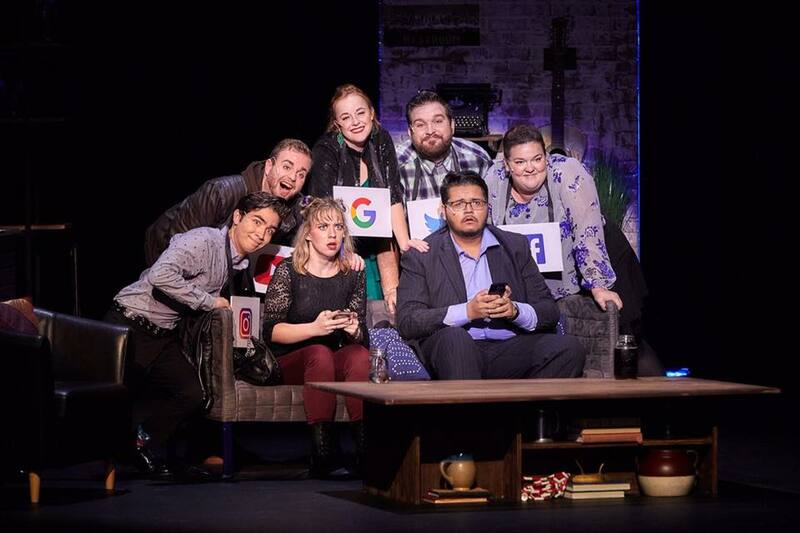 Boasting theatrical modernizations, MCC Theatre delivers an intimate experience to stage performances and the Valley-favorite Art Gallery embraces the dynamic and multidisciplinary nature of today’s visual culture. At the Red Mountain campus (7110 East McKellips Rd. ), the Rehearsal and Performance (RAP) Centre has state-of-the-art lighting and sound systems, is located in the Saguaro Building and hosts several performances by the Arizona Cantilena Chorale. The Performing Arts Center hosts multiple Jazz events this fall you won’t want to miss: MPJE Jazz Concerts on Sept. 25 and Nov. 27; Jazz Ensemble Concerts, Oct. 3 and Nov. 28. Tickets from $8. Enjoy a free Jazz Combo concert in the PAC lobby on Oct. 4. This fall’s MCC Art Gallery Faculty & Staff Exhibition, runs through Oct. 25. Admission is free and open to the public during Art Gallery hours Mon. - Thursday, 9 a.m. - 5 p.m. The first musical offering at the Performing Arts Center is "First Date." A casual first date at a busy New York restaurant turns into a hilarious high-stakes dinner where sparks fly - or do they? Sept. 20-22; tickets start at $18. Mature audiences recommended. The Seven Deadly Sins show up in the MCC Theatre & Film Arts mainstage season production of "Doctor Faustus," one of the most durable myths in Western culture. It’s the story of a learned German doctor who sells his soul to the devil in exchange for knowledge and power. Oct. 12-20. It’s alive! Reserve seats for MCC’s production of "Young Frankenstein—The Musical," Oct. 26-Nov. 3, including matinees, in the Performing Arts Center (PAC). The grandson of the infamous Victor Frankenstein inherits his family’s estate in Transylvania and finds himself in the mad scientist shoes of his ancestors. Patrons of the Oct. 31 performance are invited to participate in a Halloween Costume Contest. Tickets start at $18. For mature audiences. "The Intelligent Design of Jenny Chow" is Nov. 30 – Dec. 8 at the MCC Theatre. Rolin Jones' irreverent "techno-comedy" chronicles one brilliant woman's quest to determine her heritage and face her fears with the help of a Mormon missionary, a pizza delivery guy and her astounding creation called Jenny Chow. Tickets start at $9. A Band and Orchestra Concert is in the PAC on Oct. 2 and Dec. 4 featuring MCC students, professionals and community members. Directed by Rob Hunter, Paul Brewer, and Brian Murphy; tickets from $8. The Desert Echoes Flute Project Concert is Oct. 5 in the PAC. This is an exciting and adventurous flute choir program project sponsored by theMCC Music Department. Members from metroPhoenix include professionals, music educators, college students and community musicians. Rounding out the season's music performances is a Choir Concert Oct. 11 featuring theMCC Concert Choir, MCCC Vocal Jazz Ensemble, and MCC Community Choir performing a variety of secular, pop and spiritual music. Directed by Joey Johnston and Dr. Craig Peterson and priced at $8 or less. Find details about upcoming performances in November and December at MCC Arts/events/music. Another special treat this fall is the MCC Dance Company’s Fall Dance Concert 7:30 a.m., Nov. 8 and 9, in the Performing Arts Center with special guests OnTap and Propel. This concert showcases the eclectic mix of Modern, Ballet, Tap and Jazz Dance for which MCC is known. Original choreography is inspired by works of art and legendary people. Tickets start at $18. Nov. 26 through Jan.25, check out Ceramics+ at the MCC Art Gallery. This invitational exhibition demonstrates concepts in contemporary ceramics with works from professional, local artists using clay alone or blended with other materials and mediums. This free exhibition may be experienced weekly, 9 a.m. - 5 p.m., Monday - Thursday. Wait, there’s more! Reserve your seats now for NT Live Screenings for October and November, which include "Macbeth" starring Rory Kinnear in this intense and terrifying tragedy on Sept. 7; "Frankenstein" on Oct. 26, starring Benedict Cumberbatch as The Creature; and a different "Frankenstein" on Nov. 2, with Jonny Lee Miller as The Creature. Finally, "King Lear" with Ian McKellen on Dec. 14 finishes up the NT Live Screenings for the fall season. National Theatre Live is the National Theatre’s groundbreaking project to broadcast world-class theatre to cinemas in the United Kingdom and internationally. Shown in the MCC Theatre, tickets starting at $9. Always a favorite is "Broadway Bound, A Musical Revue." Enjoy an evening of musical theatre and holiday-inspired hits that leave you humming a joyful tune. A holiday cookie and beverage reception follows the 7 p.m. Dec. 1 performance. Purchase tickets by calling the box office at 480-461-7272. Patrons should use the Solar Way entrance from Dobson Road for easy access to the MCC Theatre and Art Gallery. The Longmore Way entrance west of Longmore Avenue is the closest access to the Performing Arts Center. Parking is free. Learn more and reserve seats at mesacc.edu/arts. Those who are interested in a glimpse behind the scenes during the development and rehearsals of the shows can follow progress on social media: MesaCC Facebook, MesaCC Twitter and MesaCC Instagram. Mesa Community College is accredited by the Higher Learning Commission (HLC) of the North Central Association (NCA)http://www.ncahlc.org.